In the early 60's, California guitar manufacturer Mosrite developed a futuristic-looking guitar known as "The Ventures" model. The band utilized these new Mosrite guitars on "Ventures in Space" in 1963. It was one of their most influential albums because of the unique guitar sounds. When the Ventures approached Semie Moseley about a special model, they wanted something like a STRAT. Semie flipped over a Fender and traced a reverse body. Moseley added other notable features like a German carved edge relief he learned about when working for Roger Rossmeisl at RIC, the trademark angled fingerboard with the slanted-back neck pick-up and the ultra-sensitive Vibramute. 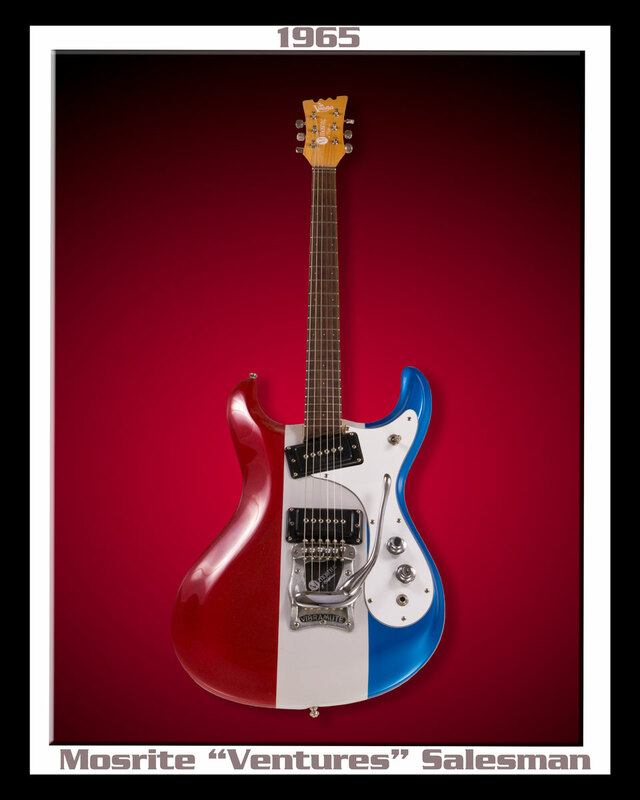 This particular RED, WHITE & BLUE Mosrite has its own unique history. Only 50 of these rare salesman-models were produced between '64 & '65. 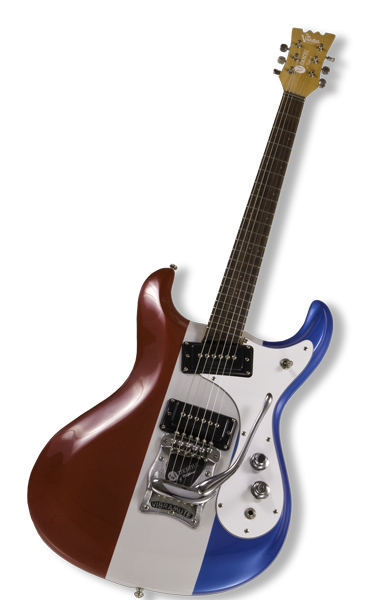 A salesman would enter a guitar shop and say... "Here's your Mosrite options and by the way, these are the colors we offer... RED, WHITE or BLUE." 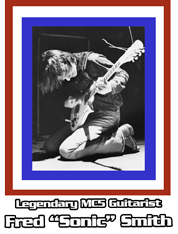 Mosrite guitars were played by many rock artists such as Tommy Tedesco, Davie Allan, Kurt Cobain, Joe Maphis, Larry Collins, The Ventures, The MC5, Iron Butterfly, Arthur Lee and Johnny Ramone. 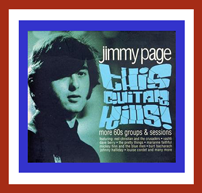 Before Jimmy Page rose to guitar rock-god status with the Yardbirds and Led Zeppelin, he was England's premier session guitar player. Legend has it... during that period in his studio guitar arsenal he was a proud owner of a Mosrite Venture Guitar.